Sometimes, when you least expect it, you make new friends! 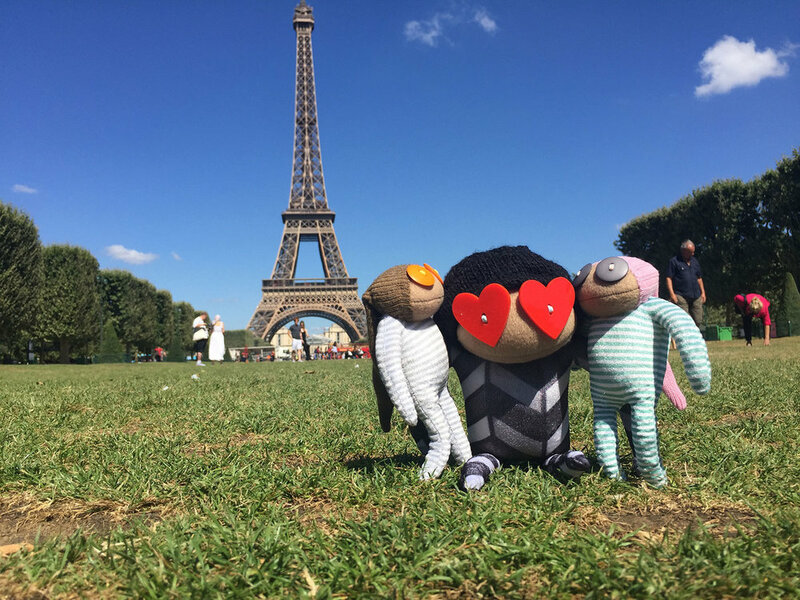 Yes, they know a weekend in Paris is never enough, but they decided they would make the most of it. They took the Eurostar Friday evening, so they could enjoy the whole day Saturday and most of Sunday away. So off they went! Paris in the summer is beautiful! The parks are green and there’s people everywhere. Everyone wants to be outside enjoying the sun. So did Malcolm and Rita! So they headed straight to Jardin de Tuilleries, their favorite park in Paris. However, it was way too hot to properly enjoy a park. Malcolm thought he would literally melt, and Rita lost her appetite during the day. But, the lovebirds are not the type of dolls that will let a little heat wave get in the way of their holiday. They looked around and noticed they were really close to the Louvre. So, they did what anyone in their right minds would do: they took advantage of the museums’ air-conditioning. “I have been to Paris multiple times, but I’ve never found the time to really enjoy the Louvre before”, Rita said. They browsed some of the greatest pieces of art in the world during most of the day on Saturday. They thought of Howard a lot. They figured he would have found a lot of inspiration for his future artwork there. They were not very impressed with the Monalisa, though. They thought it was too small. Later, they decided to head to Montmartre. This picturesque neighborhood is quaint and lively, bursting with cute little shops and restaurants. It’s the area Malcolm and Rita usually think of when they think of Paris. They were hungry by then, so they stopped at a cute little restaurant on their way to the Sacré-Coeur. They want to have something local, maybe a nice cheese plate with baguette to start. But… they ran into a little problem. They couldn’t speak French! They kept trying to communicate with the waitress, but she just could not understand them. When they thought all was lost, someone on the table next to them came to the rescue! She translated what they want for the waitress. They were so grateful they invited her over to have dinner with them. So that's how Malcolm and Rita made a new friend on their holiday. Her name is Amèlie, and she’s French. She has lived in Montmartre her whole life. Malcolm, Rita and Amèlie got on so well that she showed them around Montmartre, and she even went to the Eiffel Tower with them on the next day, before they took their train back to Brighton.